“Sothis is the stellar manifestation of Isis; like Isis, she is a pure channel for divine love and wisdom. Sothis is also Sirius, the Dog Star, which is the brightest star in the sky. Sothis/Isis follows her husband (Osiris as the constellation Orion) into the Underworld when it disappears from view for seventy days, the number of days for the funerary rites in ancient Egypt. As she appears again, rising in the eastern sky after her sojourn in the Underworld, her presence heralds the coming inundation, the New Year in the ancient calendar of Egypt. As Sothis rises in the night sky, she pours fourth her spiritual essence, her stellar energies, and her compassionate wisdom upon all beings. Through her willingness to offer us these precious gifts and her guidance, we are elevated to a greater understanding of our own soul’s purpose and the reasons we are here on Earth at this time. Sothis is the star of humanity and a true bodhisattva, calling forth the best in each of us and inspiring us to step into our higher selves and offer our own unique gifts back to the world. As Isis is the Great Mother of the Earth, Sothis is the Queen of the Sky. 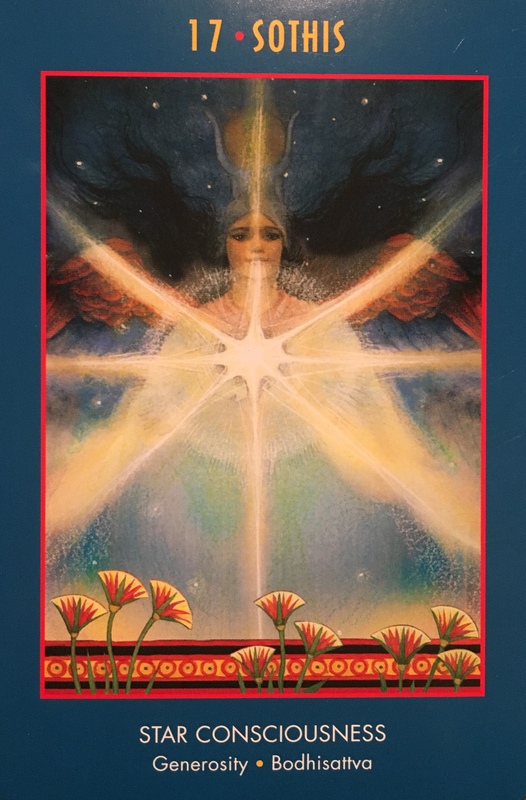 If you have pulled this card, you are being asked to embody your star consciousness. The star of your being is rising. Use this as an opportunity to be seen in the world and to emerge as a consciousness teacher of something your life has taught you. You have something wonderful to share. If you find yourself having an Underworld experience, you can be sure that you will rise once again when the time is right and the cycle is completed. Instead of despairing, you have the opportunity to express your gratitude for all that you have learned on your journey. Be as Sothis a generous light in the darkness. We often look outside to those who have wisdom to offer us. We seek their advice and compare our stories, wondering if our future holds similar patterns. We don’t trust ourselves to find solutions and we wish that someone could just tell us what to do; solve our problems for us. Sometimes we run from these problems, only to find we have recreated them elsewhere. At some point, we must stop and face them head on. And in doing so, we may just find they are not nearly as scary as we once perceived. Isis comes to us in her stellar form, Sothis, to remind us that we have inside us the very wisdom we seek. That we are, in fact, the shining light that can inspire and uplift others; leading them forward on their paths to follow their hearts and fulfill their dreams. We don’t need a certification to do this, or a guru to tell us how it’s done. We don’t have to worry that we are not qualified; as we are drawing on life experience and deep inner wisdom, not book learning. Accessing this deep inner wisdom requires commitment, stillness, trust, confidence in our ability to connect and receptivity to what comes. Opening our hearts and minds to align with the Divine Light within and allowing it to shine out. Each one of us has a gift to give. Be generous with your gift, and the Universe will be generous to you.